The 2015 tour stops include Phoenix, AZ (Feb. 27 – March 1), St. Louis, MO (March 20 – 22), Nashville, TN (April 17 – 19) and Austin, TX (Sept. 4 – 6). In its seventh year of touring, LEGO KidsFest is visiting a few less markets this year to focus on its new LEGO Creativity Tour. “With the pilot of the LEGO Creativity Tour in Biloxi, Mississippi in December, we expect to be sharing some news about new tour dates early next year,” said Vince Rubino, Events Manager for LEGO Systems, Inc.
Five sessions — all identical and 4½ half hours in length — are held at each tour stop. 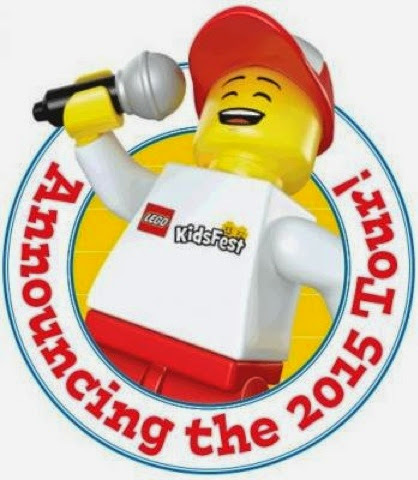 LEGO KidsFest tickets can be purchased atwww.LEGOKidsFest.com.